The Gold Coast’s M-Phazes drops his debut album titled Good Gracious on February 25th. If you don’t know who M-Phazes is, you’ve been living under a rock for far too long. M-Phazes is doing what everyone in australian hip hop wishes they could, breaking the US market, while still calling Australia home. I was gonna start listing his production credits, but it’s seriously just too much; you can head to his MySpace and see a list of stuff he’s worked on. Follow through to read more about M-Phazes – Good Gracious or grab it on itunes. Good Gracious is easily one of the most anticipated albums being released in 2010 thats lingered form 2009, everyone wants to hear it and everyones going to have a view on how it sounds. For the first time though they’re probably all going to agree on something, M-Phazes oozes awesome. The long awaited debut full length album from acclaimed producer M-Phazes is finally here. Renowned for his ability to craft the perfect beat, his global pedigree is reflected by praise from his peers with an ever-growing list of artists seeking his sound for the backbone to their flow. After two years of countless studio hours, the album is his artistic triumph; a selection of work culled from the best of his production. Enlisting an unmatched collection of Australia’s most respected MCs, this 15-track album elicits a response synonymous with it’s title. From the album’s opening manifesto “For What It’s Worth” (featuring Solo of Horrorshow), M-Phazes makes his artistic statement clear; ambition armed with his signature contemporary flip on soulful boom-bap music. In the first single “Goodbye Gravity”, M-Phazes’ work is met head on by Muph & Plutonic’s energetic live setting; resulting in a remarkable connection between live instrumentation (bass, keys & guitar with Plutonic Lab on percussion) orchestrated by M-Phazes and Muph’s distinct vocal tone. Highlighted by Melbourne soul singer Candice Monique’s choral hook, “Goodbye Gravity” is a certain achievement on its own. Having worked with noted artists like chart-topping Amerie (Island Def Jam) and Pharoahe Monch, M-Phazes’ musical influences continue to expand. In the Phrase-featured track “Music Box,” elements of dance, electro, and pop are layered together in perfect harmony, creating the album’s sizzling dance floor anthem. Having received an ARIA win for his work with Bliss N Eso, their collaboration continues in “Walk On Clouds” which will be Bliss N Eso’s only guest feature prior to the release of their next album. From the humorous (the Drapht-featuring conspiracy theory song “Where’s Elvis?”) to the gritty (“That’s What We On” featuring Nine High) to the soulful (see Illy’s introspective outro “Take It From Me”; a musical masterpiece comprised of live drums, guitar, keys, bass & a mini-choir), rarely does a debut album cover such immense ground in the musical spectrum. Showcasing the ridiculously talented future of Australian hip hop (Mantra in “The Freak Show” and Dialectrix’s spitfire rhymes in “The Facilitator”) alongside some of the biggest names in the business, there is no doubting M-Phazes’ career trajectory as Australia’s #1 merchant of music. Having future work with Kimbra and Bertie Blackman already on the books alongside the release of what some may just call his magnum opus, there are few words as fitting as Good Gracious! 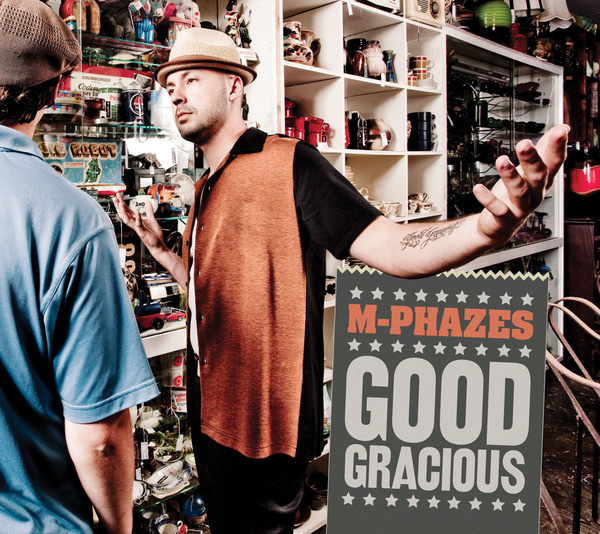 Update: Grab M-Phazes-Good Gracious on iTunes now.